In 1998, Jennifer Leyton’s mother was dying of Huntington’s disease, an incurable neurologic disorder that robs people of movement and thought. Because the huntingtin mutation is autosomal-dominant, Leyton knew she had a 50 percent chance of having inherited it. Leyton was young and wanted children, but she was determined not to take the chance of passing on Huntington’s to the next generation. She turned to what was then a rare technique—preimplantation genetic diagnosis (PGD). In this procedure a woman undergoes in vitro fertilization, then doctors test the resulting embryos for the mutant gene and implant only those that do not carry it. Leyton searched far and wide before she found a clinic, the Genetics & IVF Institute in Fairfax, Virginia, that could do this for her. She did not know if she herself carried the disease gene and wanted to keep it that way, so her doctor’s promise not to reveal her status was a key factor. Leyton and her husband traveled regularly from their home in New York City for the procedures. She endured physical ordeals associated with IVF, such as mood swings and bloating from taking hormones, and pain from having eggs harvested. The first attempt failed, but on the second try, Leyton became pregnant and eventually gave birth to healthy twins, a boy and girl, who are now 14. Jennifer Leyton with her husband and 14-year-old twins. Image courtesy of Jennifer Leyton. For Leyton, all the trouble was worth it. “Yes, it was painful and hard on my body. It was expensive. But that doesn’t matter. 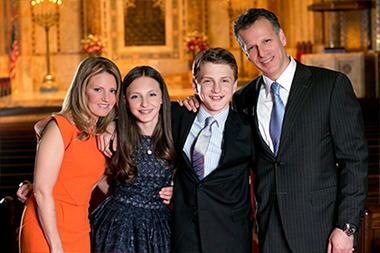 What matters is I know my children will never, ever have this gene,” she told Alzforum. Leyton’s story is becoming more common. Most fertility clinics in developed countries now offer PGD, and thousands of couples have used it to avoid passing on genes for serious disorders. (PGD is different from the experimental, and controversial, “three-parent” technique being tried to avoid passing on flawed mitochondrial DNA. That method was profiled June 30 in The New York Times.) In surveys, a majority of couples at risk for severe genetic diseases indicate they prefer PGD to getting prenatal testing later via amniocentesis and facing the wrenching decision of whether to terminate a pregnancy (see Musters et al., 2010). However, the use of PGD for adult-onset neurological disorders remains quite limited. Only a small percentage of Huntington’s families have used it, and a mere handful of families with Alzheimer’s genes are known to have done so. Mainly, this is because few people with autosomal-dominant AD have heard of this technique or realize it is an option for them, according to those in the field. The expense and difficulty of the procedure deter some people. Others do not realize they can get PGD without having to find out whether they carry the disease gene themselves. Having a mother or father with a familial AD mutation can be enough to qualify for PGD. Alzforum contacted about a dozen families with autosomal-dominant AD, and once they heard about this option, many expressed tremendous interest. “I have already lost six family members [to AD], and two of my three children will be added to that list. I would love it if my grandchildren had the chance to stop this in our family,” one anonymous commenter whose family carries a presenilin mutation wrote in an FAD support group discussion. Society as a whole has just begun to grapple with the implications of this technology. Some ethicists have raised concerns about PGD for diseases that begin in middle age. People with familial AD or mutant huntingtin genes can enjoy 30 to 50 years of healthy life, and it is not fair to deny that life to embryos carrying the gene, these ethicists argue. However, most reproductive-medicine societies support the use of PGD to prevent serious adult-onset conditions. In 2012, the European Court of Human Rights ruled against restrictions in Italy that had banned fertile couples from using the procedure for disease prevention. Some researchers believe PGD could be an effective way to combat inherited neurological disorders. “If people were aware of this and prepared to do it, we could get rid of the early onset dominant diseases in a generation,” said neurogeneticist John Hardy at University College London. This two-part series provides an overview of PGD with perspectives from people who have taken advantage of it. Today’s story covers the history of the technology and how it is used; part two will describe some considerations that go into the decision to use PGD. PGD was first described in London in 1990 as a way to avoid passing on X-linked hereditary diseases (see Handyside et al., 1990). The procedure can be performed only in conjunction with in vitro fertilization. After doctors harvest eggs from the mother and fertilize them in a dish, they remove a few cells from the embryos for testing. About 90 percent of clinics do this on day three, when the embryos are at the six- to eight-cell stage. A few clinics wait until day five, when the embryo has become a blastocyst with an outer layer of trophectoderm cells that later form the placenta. In this case, clinicians remove trophectoderm cells for testing. Some evidence suggests this latter method has a lower chance of disrupting the embryo’s development (see Scott et al., 2013). Fertility clinics often send these biopsies to a separate genetics lab for analysis, meanwhile freezing the embryos to await the results. At five days old, the embryo is called a blastocyst, and can be tested for disease genes. In another variation, clinicians can test the mother’s eggs by looking at polar bodies. These are discarded DNA from the meiotic cell division that generates the haploid egg. 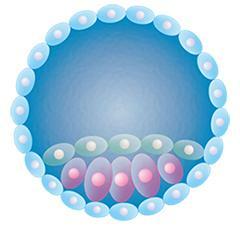 Polar bodies remain stuck to the egg until fertilization, when they degenerate. If the haploid polar body contains the disease gene, doctors can infer that the egg retained the other, healthy gene (see Verlinsky et al., 1990). This method only works if the mother is the at-risk parent. Once the presence of healthy embryos is confirmed, doctors discuss with their patients whether to implant one or two into the mother’s uterus. In the past, clinics often recommended two, but many centers now believe that a single-embryo pregnancy has a greater chance of success, said genetic counselor Margo Grady at Generations Fertility Care in Madison, Wisconsin. About 30 percent of embryo transfers result in a pregnancy, and about 80 percent of those pregnancies go to term, according to data collected by the European Society of Human Reproduction and Embryology (ESHRE) PGD Consortium (see Harper et al., 2012). These babies are as healthy as babies born through standard IVF procedures, the consortium reported. Use of PGD has grown steadily over the past two decades. In the United States, about 5 percent of IVFs now involve such screening, according to data from the American Society for Reproductive Medicine. ESHRE figures indicate that about three-quarters of PGD procedures worldwide are done in older mothers to check that the number and shape of chromosomes are normal, or in families with known chromosomal translocations. Another 20 percent are done to screen for one of more than 200 single-gene or X-linked diseases. Data collected by ESHRE from 87 centers, the majority located in Europe, recorded about 1,600 uses of PGD for single-gene disorders in 2009, the latest year for which data has been published (see Moutou et al., 2014). The ESHRE PGD Consortium represents only a small portion of fertility clinics worldwide that use the technique, implying that actual numbers could be much higher, noted Veerle Goossens, who oversees data collection at ESHRE. Most often, families request PGD to test for diseases that manifest early in life, such as the blood disorder β thalassemia, cystic fibrosis, or spinal muscular atrophy. Its use remains rare for adult-onset neurological disorders. There, the main application is Huntington’s disease, with ESHRE data recording 136 PGD uses in 2009, and a total of 530 between 1997 and 2007. At typical success rates, this would translate to perhaps 200 to 300 children born free of the disease in this manner since 1997—a drop in the bucket compared with the total burden of Huntington’s disease. About 30,000 people in North America alone have HD, with another 150,000 estimated to be at risk of carrying the huntingtin gene repeats. These numbers are according to the Huntington Study Group, an organization of clinical researchers based in Rochester, New York. PGD for familial AD occurs even less often. The Reproductive Genetics Institute, a private PGD laboratory in Chicago, in 2002 published the first report of use by a 30-year-old woman with an APP mutation (see Verlinsky et al., 2002). Her child is now 13 years old, but RGI declined a reporter’s request to mediate an interview with the parents. Since 2002, RGI has used the technique to help families with autosomal-dominant AD give birth to six more unaffected children, Anver Kuliev at the institute wrote to Alzforum. Most clinics Alzforum contacted said they have never treated a couple with an AD gene, though Murali Doraiswamy at Duke University, Durham, North Carolina, was involved in a recent case. There is no record of PGD being used for Alzheimer’s in the ESHRE database, Goossens wrote. 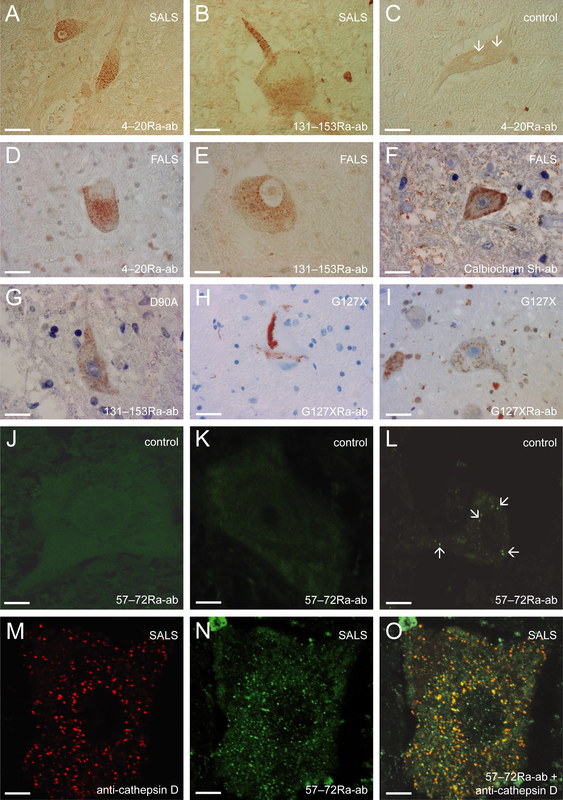 Frontotemporal dementias (FTDs) and amyotrophic lateral sclerosis (ALS) can also be inherited in autosomal-dominant fashion, but even fewer people at risk for these diseases have tried PGD. Kuliev told Alzforum that RGI has worked with one person at risk of an ALS gene, and that person delivered a healthy child; Kuliev is currently working with two more prospective parents from families with ALS. Brad Dickerson at Massachusetts General Hospital, Boston, runs a large clinic for frontotemporal dementia. Dickerson knows of three young women who inherited an FTD gene and used PGD to have unaffected children. Most clinics have never seen a case, however. The GIVF Institute that treated Leyton said they have never had a person at risk for FTD, ALS, or AD even inquire about PGD. The scientific literature contains one published report of five mutation-free babies born through PGD and IVF to South Korean families carrying mutations for the neurological disease Charcot-Marie-Tooth (see Lee et al., 2013). Clinicians and counselors who work with families at risk of these diseases say that most are simply unaware that PGD exists as an option. In many cases, primary care physicians and neurologists do not tell them about it. A recent survey of U.S. internists found that only 5 percent had ever recommended PGD to a patient, and only 7 percent felt qualified to answer patients’ questions about the procedure (see Klitzman et al., 2013). Neurologists typically do not have this issue on their radar, Dickerson noted. Doraiswamy recently argued that the time has come for neurological societies to consider developing guidelines to help their members talk to patients about PGD (see Tur-Kaspa et al., 2014). A group of geneticists, psychologists, and ethicists in the Netherlands and Belgium recently formulated recommendations for good clinical practice in the care of families facing this issue (see de Die-Smulders et al., 2013). Neurologist Samuel Frank at Boston University told Alzforum that perhaps one-quarter of the HD patients he sees know about PGD, and most of them found out about it on their own by searching the Internet. Many of the first families to use PGD for neurological diseases came from highly educated or medical backgrounds. A survey of families in Portugal who carry a hereditary neuropathy found that those who knew about PGD tended to be younger and have higher incomes than those who did not (see Valdrez et al., 2014). Dickerson said that the women with FTD genes who used PGD found out about it because their families were involved in research studies. Some advocacy groups spread the word among their members; for example, the Huntington’s Disease Society of America holds presentations on PGD at their annual conference. Most of the familial Alzheimer’s community remains in the dark about this procedure. When PGD was presented to a familial AD support group in London in February 2013, most had never heard of it. In a follow-up conversation in 2014, group members expressed that they wished they had known about this option before they had their children. “I definitely would have looked into testing,” wrote one commentator. “Now my two children each have a 50 percent chance. It breaks my heart.”—Madolyn Bowman Rogers.